Venice, one of the most beautiful cities in the world. Also, a very crowded and touristy town, so that photographing it can be a challenge – especially during summer. In spite of the warmth, the number of tourists and their hungry mosquitoes, Venice remains a paradise for photographers and there are still uncrowded corners if you leave the busiest areas: the best advice anyone can give you about Venice is to try to loose yourself on their streets! During our visit to Venice in August – probably the worst time of the year to travel to this island – we got lost in narrow alleys and also visited some of the most photographed places in town. If you get easily overwhelmed by crowds avoid Rialto, San Marco and Ponte dei Suspiri and try to get lost in areas like Cannaregio and Santa Croce, which also offer photo opportunities without stress. Nothing more Venetian than gondoliers sailing the canals. Below you will find my favorite photo in Venice: this moment was beautiful, non staged and totally justified the trip. My sole intention was to get the photo sitting in that corner, watching the gondolas passing by. 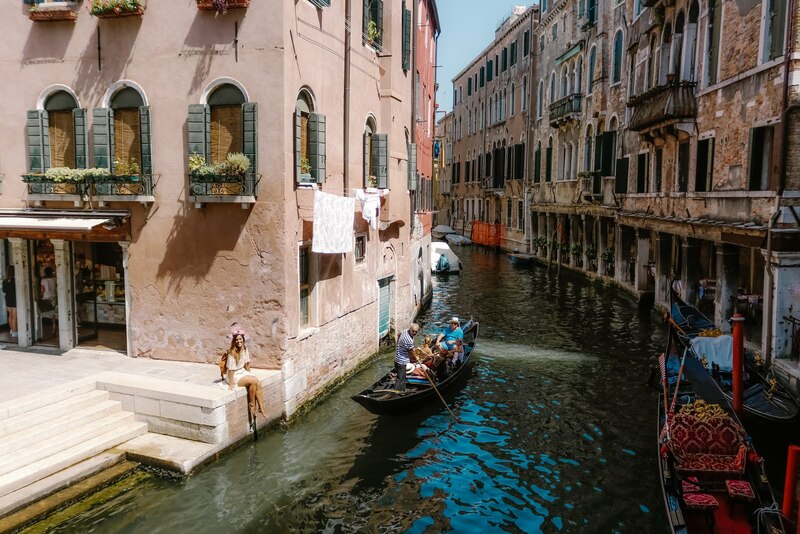 To my surprise, the first gondolier who arrived came to me, greeted me with a typical “Ciao, Bella”, asked my name and kissed my hand – so Italian! A moment I won’t forget. Rialto Bridge is an icon in Venice and therefore, one of the most touristy spots in the city. Pay attention to your belongings and instead of fighting for a photo, you can have a gelato or a spritz at one of the terraces surrounding it. Aqua Alta Bookshop is with no doubts, unique, romantic and one of the most beautiful bookstores in the world. In autumn and winter it gets flooded from the channels, so books are places in funny locations as a gondola or a bath tub, and a few cats make the place even better. The most famous spot in the library is the terrace with the book steps, from there you can enjoy the view and take some awesome photos. My favorite place in Venice? This gorgeous bookshop! If you like books, it's easy to find little treasures 📚 | Passaria horas nesse lugar! When in Venice, get lost and run away from crowded places. That’s how we ended in Ponte Chiodo, a double bridge located pretty close to the old Jewish ghetto of Cannareggio. This small palace and its spiral staircase offer a panoramic view of the roofs of Venice, crowned by the Campanile of San Marco. From here you will get the most perfect postcard from Venice: it has everything! A canal, a dike, a bridge… and gondolas passing every few minutes. Get a pizza and enjoy this beautiful corner! The centre of Venice is Piazza di San Marco: a place full of history, architecture… and tourists. From 2018 the square will have a limit on the number of visitors. Despite the amount of people, it’s an amazing place so try not to miss it. Ponte dei suspiri (which means Bridge of Sighs) is another unmissable place while in Venice. You’ll get the best views from Ponte della Paglia, but make sure to visit it for sunrise for a not so busy experience. A visit to Venice cannot be complete if you don’t take a vaporetto to the neighbor island of Burano. This colorful island, which seems to be taken from a Disney stage, is photogenic in each of its corners, without exception. You won’t regret the visit! It takes around 40 minutes to take there so spend in Burano at least half day.